While they researched on regenerative energy sources made of microalgae, San Francisco based biochem startup Solazyme came across an ingredient that, according to them, might have significant anti-aging properties: Alguronic Acid. A broad mix of polysaccharides produced by microalgae. The structure of the molecule is a little more complex than the one of Hyaluronic Acid, which found its way in our cosmetics a few years ago but it has a similar hydrating feeling. 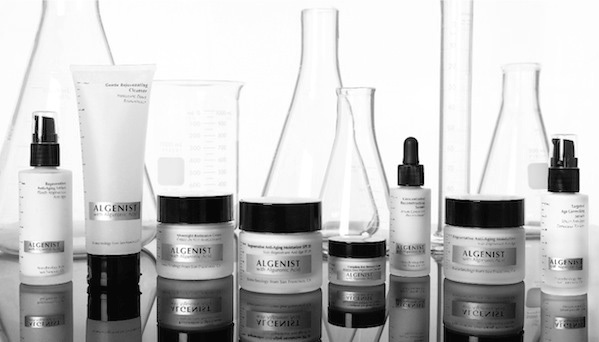 According to Algenist officials, alguronic acid was better than the other compounds in inhibiting the formation of melanin, a pigment that creates age spots (and a tan, beach bronze girls beware); increasing the production of elastase (contributes to skin firmness and elasticity); diminishing the production of elastase (enzyme that breaks down elastin) and decreasing inflammation in skin tissues exposed to UV rays. Algenist’s tests were conducted in vitro, which means using human tissue made in lab, and all in all it may sound very promising but hence the fact there is no independent research on beneficial effects of Alguronic Acid skin critics (see here and here) and me are not very intrigued on spending up to $65 for their eye renewal balm to $135 for their anti-aging moisturizer, but reviews of The Algenist Concentrated Reconstructing Serum were quite promising (see here), probably because it contains the highest concentration of the active microalgae ingredient and niacinamide out of any of the Algenist products (niacinamide has been clinically proven to treat hyperpigmentation, soften skin and to eliminate mild cases of acne). For scientific reviews of the other products you should check out Paula’s Choice list, which is gives a short overview of the products’ ingredients. Big props for the minimalist product design, Ea Birkkam.